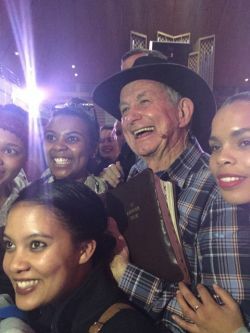 For the past three weeks farmer evangelist Angus Buchan has been preaching to capacity crowds at South African universities that have recently experienced rioting. “This [campus] tour has taken precedence over everything else. I’ve even had to cancel a trip to the United States of America because of the urgency of the hour,” he said in an interview today after completing five of six campus meetings on his SA campus tour from April 27 to May 19. He says the campaign was initiated at the request of students at Stellenbosch University. “We are following in the footsteps of all the unrest that took place on the campuses. But I can honestly tell you we saw no sign of unrest, or anger or any kind of violence — in fact the opposite. 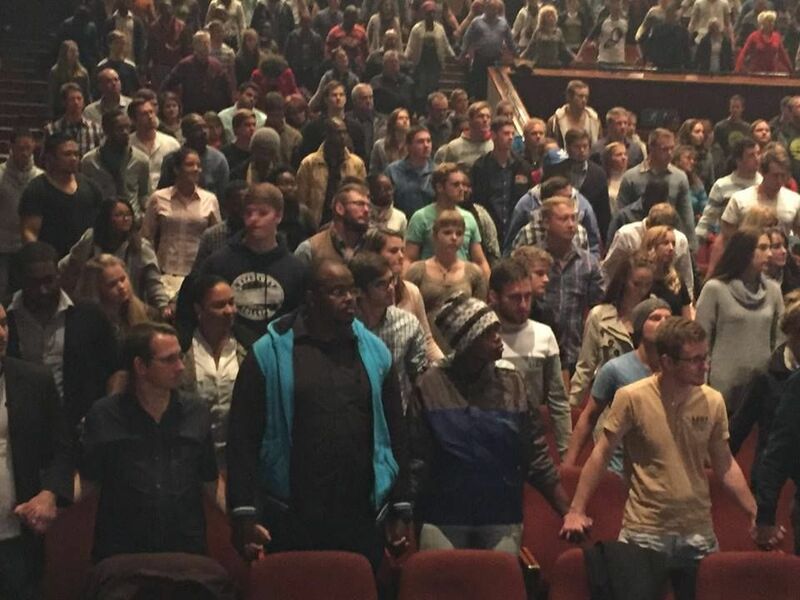 He said his rally at the University of the Free State last night “was inundated, there was no room left”. UFS students were joined by matrics from Grey College. “There were blacks, coloureds, whites together, completely caught up in the Spirit of God — reconciliation like I have never experienced in all my preaching. “And when I asked those who were suffering from depression and anxiety and stress and fear to put their hands up, literally the whole auditorium raised their hands. 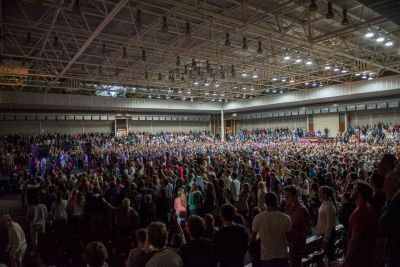 And the tragedy is these are all young people from the ages of 18 to 25 years old, but they are absolutely on fire for Christ. At the University of Johannesburg (UJ) Buchan and his team arrived very late because they were held up for four hours after their plane broke down in Johannesburg. 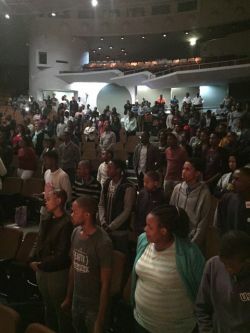 “But those [UJ] students never left, They waited for us from quarter past 12 to half past one and the response again was 100% commitment to follow Jesus Christ and no-one else. He said at their first meeting, at the University of Cape Town, they saw some people protesting about gay rights and feminism outside the venue. The meeting organisers invited the protesters to come in and join the meeting but the declined. 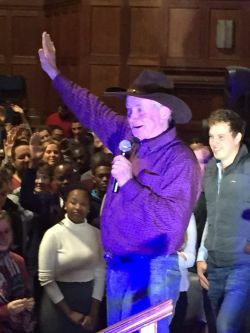 The Angus Buchan SA Campus Tour will end on Wednesday, May 18, with an event in Potchefstroom for students at North West University. The other stops were in Cape Town, April 27, Stellenbosch, May 4, Johannesburg, May 6, Pretoria, May 8, and Bloemfontein, May 11. Angus I can only admire you running with the leading of our Father God.South Africa owes you so much for your obedience.Africa will be saved. YES YES YES !!! Thank you Angus for your obedience to God !! I could help but cry when I read this amazing report. Thank you so very much Angus for what you are doing in this country! May every seed you sow bear fruit a thousand times and more. Praise the Lord for the hunger in the hearts of the students. I think most of SA wants peace and wants to work together. Lets all take hands…. Fantastic. I’ve been praying for the Lord to move on campuses, with all the ungodly rebellion and lawlessness that has been going on. Thank you, Lord, for what you are doing through your servant, Angus. What wonderful news! I jumped for joy when reading this! Oh how we need good news in our land. Angus is amazing, cancelling his US tour to deal with our Universities’s dilemmas. He brings life, hope and a future, just as God would have him do. Thank you Lord! Praise the Lord. May our Lord continue His work in SA and bring all people together and unify them and stamp out corruption and may a new wave of people come forward in the name of Jesus and stand up for Christ in our government. God is going to use the most foolish continent to confound the wise. Watch this space!